We obtained a huge bunch of fresh Autumn beetroot from the Geeveston District High School farm in colours of red, yellow and gold. 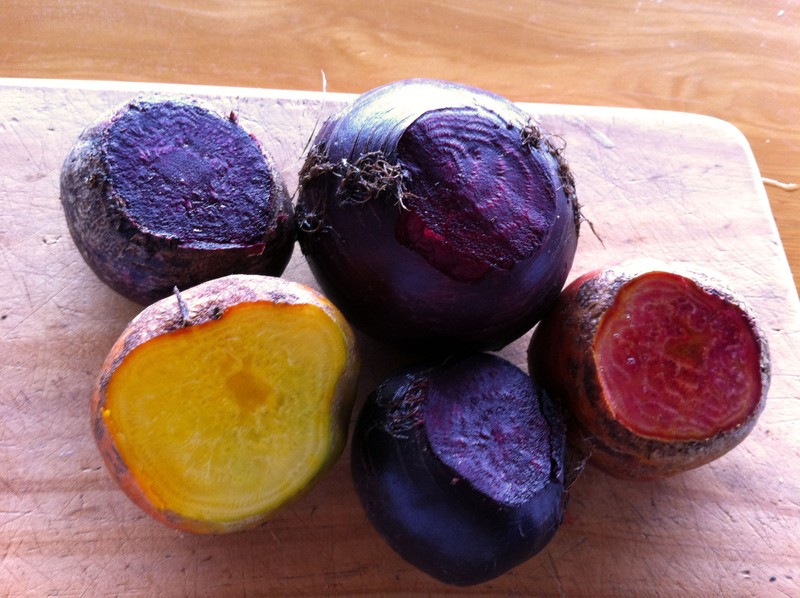 So here is a favourite beetroot recipe, which has evolved over years of experimenting. It’s easy, can be frozen in batches, and is great to have as part of a healthy lunch to take to work. Beets are rich in antioxidants, can contribute to liver health, and even have anti-inflammatory properties. Half a kilo of cooked chickpeas (If I’m organised, I have some pre-cooked. If I’m lazy, they come out of a can, certified organic. I’m often lazy!). Scrub the beetroot and and steam until tender (up to about 15 minutes, less for small pieces…I test with a metal skewer to see if they’re tender right through. The less you cook them, the more nutrition you get from them). Leave to cool. When they’re cool it’s easy to rub the skins off you you want to. Sweat the onions over a low temperature in a little olive oil until very soft. Stir the cumin through the onions over the low heat unti the onions are coated. Remove from heat and allow to cool. Chop the beetroot and place in a food processor or blender with the onion mixture, chickpeas, tahini, apple cider vinegar or lemon juice, and stock. Process till smooth. With the motor running, drizzle in enough olive oil to attain the consistency you desire for the dip. Season with the sea salt to taste. I like to eat beetroot hommus with carrot sticks and green snowpeas for a colourful lunch. It’s also great with a garden salad or some organic corn chips. This recipe is very adaptable; you could use pumpkin or carrot. 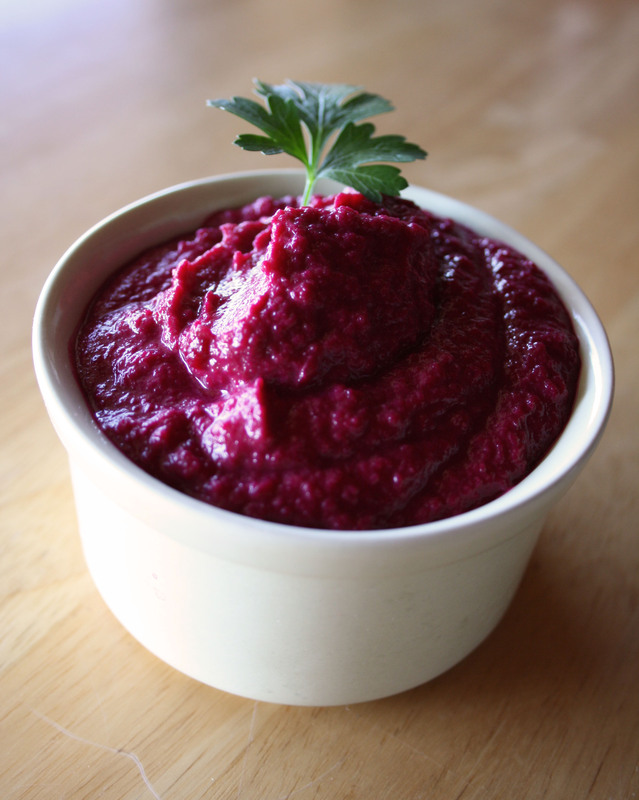 But I love the colour and sweetness of beetroot in this dip. Another of my favourite ways to eat beetroot, especially when I have a bunch of different coloured ones, is to grate them up with twice as many carrots, toss them in a splash of apple cider vinegar, and mix through some sunflower seeds. This makes an outrageously colourful and delicious salad, especially when sprinkled with blue borage flowers, or purple violets. Are Yoga classes bad for your back? Reblogged this on down to earth living.